IntelliTunes Digital Jukebox | OhGizmo! By Andrew Liszewski on 11/10/08 • Leave a comment! You know how it is. 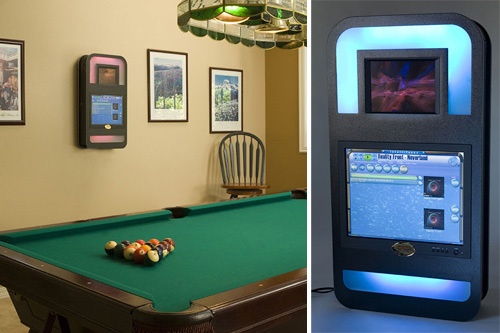 You’ve just finished renovating your basement into the perfect games room, complete with a pool table, mini bar and even a ‘dogs playing poker’ painting on the wall, but there’s just one tacky piece of the puzzle missing that will make the decor absolutely perfect. Well say hello to that last puzzle piece. While classic jukeboxes might have that retro, “hey look what I just wasted my money on!” look to them, if you don’t have a collection of small vinyl records, what good are they? The IntelliTunes Digital Jukebox on the other hand is not only able to play your existing digital music collection, but you can also rip audio CDs directly to its internal hard drive. And it does all that while looking vaguely reminiscent of the jukeboxes found in a 1950’s-era diner. It has a capacity for about 50,000 songs, and features two LCD displays for controlling and monitoring what’s being played. The top 8-inch LCD shows artist and track info as well as a “mesmerizing 3D light show” visualizer, while the bottom 15-inch touch screen LCD provides the user interface and other controls. You’ll want to keep in mind that the IntelliTunes doesn’t have any built-in speakers of its own, but it does have an UltraHiFi 360 watt 2 channel amplifier that can be connected to a pair of external speakers or tied into an existing stereo setup. It’s even got wifi for streaming internet radio, and if you’re not sold by now, I’m sure the virtual aquarium screensavers is more than enough to justify the $3,995 price tag.